Optical microresonators are attractive for frequency comb generation due to their small size compared to fiber loops or free space cavities. However, most microresonator “Kerr combs” have strong harmonic at the optical pump frequency, undesirable for applications. We theoretically and experimentally investigate Kerr frequency combs with the depressed pump harmonic. This result is achieved in a MgF2 photonic belt resonator having reduced density of modes in its spectrum and configured with the add–drop optical couplers. The Kerr combs with the depressed pump harmonic will be useful for future optical communications and advanced spectroscopy. A. A. Savchenkov, A. B. Matsko, and L. Maleki, Nanophotonics 5, 363 (2016). P. Del’Haye, T. Herr, E. Gavartin, M. Gorodetsky, R. Holzwarth, and T. Kippenberg, Phys. Rev. Lett. 107, 063901 (2011). A. B. Matsko, A. A. Savchenkov, W. Liang, V. S. Ilchenko, D. Seidel, and L. Maleki, Opt. Lett. 36, 37 (2011). T. Herr, V. Brasch, J. D. Jost, C. Y. Wang, N. M. Kondratiev, M. L. Gorodetsky, and T. J. Kippenberg, Nat. Photonics 8, 145 (2013). W. Liang, D. Eliyahu, V. S. Ilchenko, A. A. Savchenkov, A. B. Matsko, D. Seidel, and L. Maleki, Nat. Commun. 6, 7957 (2015). P. H. Wang, J. A. Jaramillo-Villegas, Y. Xuan, X. Xue, C. Bao, D. E. Leaird, M. Qi, and A. M. Weiner, “Intracavity characterization,” arXiv: 1603.03154 (2016). K. Nozaki and N. Bekki, Physica D 21, 381 (1986). Y. K. Chembo and N. Yu, Phys. Rev. A 82, 033801 (2010). T. Herr, V. Brasch, J. D. Jost, I. Mirgorodskiy, G. Lihachev, M. L. Gorodetsky, and T. J. Kippenberg, Phys. Rev. Lett. 113, 123901 (2014). 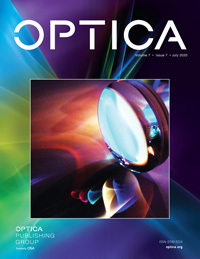 I. S. Grudinin and N. Yu, Optica 2, 221 (2015). S. M. Spillane, T. J. Kippenberg, and K. J. Vahala, Phys. Rev. Lett. 91, 043902 (2003). L. Maleki, A. B. Matsko, A. A. Savchenkov, and V. S. Ilchenko, Opt. Lett. 29, 626 (2004). B. B. Li, Y. F. Xiao, C. L. Zou, Y. C. Liu, X. F. Jiang, Y. L. Chen, Y. Li, and Q. Gong, Appl. Phys. Lett. 98, 021116 (2011). I. S. Grudinin and N. Yu, Proc. SPIE 9343, 93430F (2015). J. M. Winkler, I. S. Grudinin, and N. Yu, Opt. Express 24, 13231 (2016). Fig. 1. Numerically evaluated expression for the apparent carrier suppression for N = 1 , 2 , 3 solitons in the resonator mode and the single-soliton Kerr frequency combs ( N = 1 , μ–mode number, inset) for four different detunings ζ 0 . The pump harmonic is suppressed (b and d) at certain detunings given by Eq. (4). Fig. 2. (a) Schematics of the experimental setup. Light emitted by a tunable fiber laser is amplified with an erbium-doped fiber amplifier (EDFA) and coupled into a photonic belt resonator (PBR) using a mode-matched angle-polished fiber coupler (APC). Light exiting the resonator through the first APC is detected by a photodiode (PD). Light from another APC (drop port) is measured with an optical spectrum analyzer (Yokogawa AQ6319). (b) Picture of the cylinder that holds the PBR structures. Several belt resonators are made on the side surface of the crystalline cylinder by single point diamond turning. Location of the belt from (c) is shown approximately with arrows. (c) Profile of the PBR taken with an optical interferometric profilometer (Veeco Wyko NT9300). Belt width and height is approximately 10 μm. (d) Coupling of two APC (add and drop ports) with the PBR. Fig. 3. Numerically simulated optical spectra (shown in red) compared with the experimental results (shown in blue). (a) Incoherent spectrum. To obtain the smooth spectrum envelope we averaged the time-dependent chaotic spectrum over several cavity ring-down times. This procedure resembles the operation of a conventional optical spectrum analyzer . (b)–(d) Kerr comb soliton spectra. The simulations are performed for f = 8.5 and d 2 = 0.05 . This corresponds to the parameters of our MgF 2 comb generator: P = 19 mW , Q = ω 0 / 2 γ = 0.47 × 10 9 , η = 1 / 2 , n = 1.37 , λ = 1.561 μm , n 2 = 0.9 × 10 − 20 ( m / V ) 2 , and V eff = 2.8 × 10 − 13 m 3 . Fig. 4. (a) Linear optical spectra of a sharp edge multimode and (b) a single mode photonic belt resonator. The spectra are taken in the add–drop port configuration. (2) u 0 = F [ u ( ϕ ) ] ( 0 ) = e i ψ 0 ∫ 0 2 π [ c 0 + s e i χ ∑ j = 1 N sech ( b ( ϕ − ϕ j ) ) ] d ϕ 2 π ≃ ( c 0 + s 0 e i χ ) e i ψ 0 = ( c 0 + N s 2 b e i χ ) e i ψ 0 . (3) y = N s b cos χ + c 0 = 0 . (4) y = f ζ 0 − N 2 d 2 1 − 8 ζ 0 π 2 f 2 = 0 .